Like Yin & Yang, this past week held a great holiday of happiness, and a day to mourn; we lost a great martial artist, a great teacher, a great man. Atlanta’s martial arts scene just isn’t the same without him. It is with a heavy heart that we announce this to our readers – Master Joel Rodriguez of the 鷹 爪 派 Ying Jow Pai (Eagle Claw style of Kung Fu) has passed away. Sifu Rodriguez trained under Leung Shum in NYC for over 25 years, training Eagle Claw kung fu and Wu Taiji; he was also one of very few to receive "Master" level certification. In 1999, Joel opened an Eagle Claw Kung Fu school here in Atlanta, GA, and trained many students throughout the years. Sifu Joel was an inspiration to many, and a much valued member of the martial forest "Wulin". As the Shum Ying Jow Pai International Headquarters states, "Joel was a devoted teacher, role model, friend, and brother to many. Passionate in everything he pursued, he was an inspiration to his students and fellow training brothers." I can personally attest to this. I trained, sparred, and hung out with him. He’s judged me at tournaments. I’ve seen his demos and he’s seen some of mine. We’ve talked about Jazz clubs, Stevie Wonder, Eagle Claw, Taiji, Qigong, Personal Fitness and much more. I remember him training like mad before going up for his certification. I remember seeing him train in his school and out at the Park. I remember much about Joel Rodriguez and I miss him. He was "one of the good ones", as my father would say. 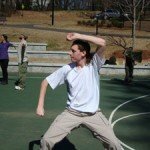 Aside from carrying the torch for the Ying Jow Pai, he did so as well for the Traditional Chinese Martial Arts community in general, and the Atlanta community specifically. He was a brother to all of us here and this hits us hard. It’s an unfortunate blessing of the blade when one passes on; people come together, refreshing old friendships and making new ones. Look at Joel’s Facebook page and see at how so many say so much. Let’s take this opportunity to join together. Our heavy & heartfelt condolences go out to the family & friends of Master Sifu Joel Rodriguez, the Ying Jow Pai, his students, and all the other people he touched and inspired. Thank you, Joel, for all that you’ve done – your memory, inspiration and achievements live on. Please share your stories. Give condolences and support to the Ying Jow Pai. And give of yourself – train hard & train well – honor the legacy – and be inspired by our departed brother.